The snow did come — about a foot of it. I have been housebound for more than 24 hours and am starting to get a little antsy, but it is 17 degrees outside and the sun is going down, so the outdoors will have to wait til tomorrow. Notwithstanding my little guy’s pleas to find the Buzz Lightyear figure he dropped somewhere in the snow on his way back from our neighbors’ house. Today tested that theory of mine about wintertime being easier for the stay-at-home mom. My freak-out started around 8:30 am. Runny noses, snot-crusted faces, yelling, hitting, not-sharing, refusal to wear diaper/clothes… and the clock seemed like it wasn’t moving. Then my husband went to use the kitchen sink and only a trickle came out. All I could think was, “If I don’t bake today, I will lose it.” Like couponing, baking sometimes pops up as a cover story for “quiet mommy time.” Eventually, order prevailed. The kids next door came over and everyone was engrossed in Wii for a while. Their arrival also prompted the naked one to get dressed. The sink turned out not to be frozen — the nozzle was just clogged. Then, blessedly, my boys and their friends went back to their friends’ house, and baby girl went down for a nap. Before she was fully asleep I had the oven preheating. 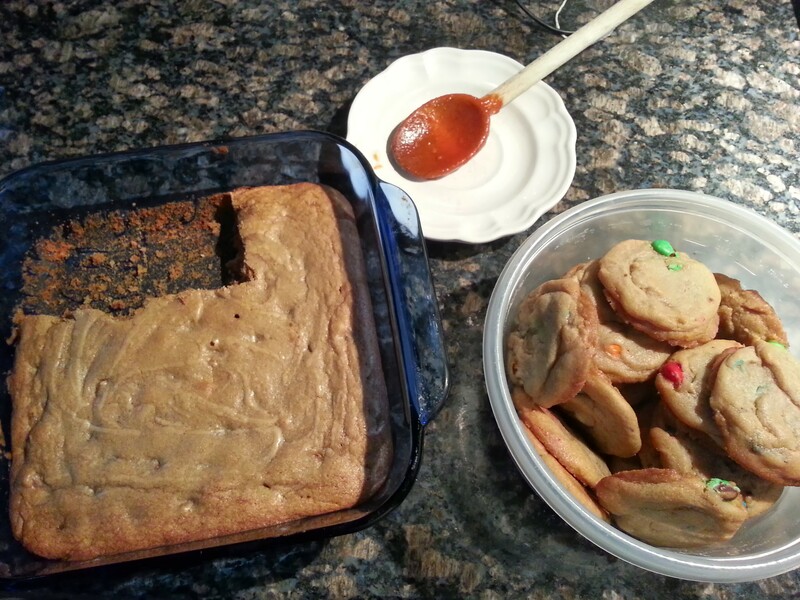 Soon I had knocked out a pan of blondies plus some more of those M&M cookies from Joe Corbi fundraising dough. The blondies are really good, I must say. I have a thing about blondies. There used to be a bakery around here that had a really great one. I used milk chocolate chips. Delish. Whenever I bake I think about Sylvia, the movie about Sylvia Plath with Gwyneth Paltrow. There’s a scene where her writer’s block drives her into the kitchen, where she embarks on a bake-a-thon. She covers every countertop with pies, cookies, cakes. I don’t know how accurate it was, but I could relate. Sometimes you just have to make something. I remember visiting a friend of mine several years ago. Her kids are older than mine and at that time she had more of them than I did. She showed me a small quilt she was making for her daughter and said something to the effect that sometimes, she just had to stop and work on something that would last. I got it then and I really get it now. The cycle of cleaning dishes that just get used again, of mopping floors that just get mucked up again, of wiping butts that… yeah. Sometimes that has to stop and make way for something permanent. Or semi-permanent, like blondies. Now dinner is on the stove: the leftover gravy from last week. Baby girl is watching PBS, little guy is passed out on the couch (I’ll pay for that later, but oh well), and my oldest is still at his friends’. I plan to give my dear neighbors some cookies and blondies as a thank you, because it has been quiet here for like four hours! Unheard of.